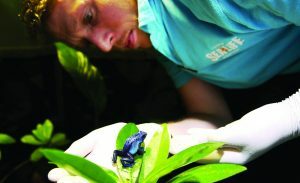 I am one of the poison dart frog keepers and Displays Supervisor at the SEA LIFE London Aquarium. 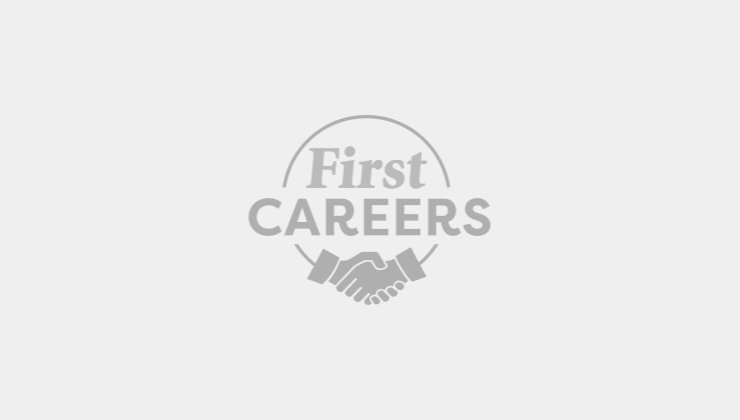 Since finishing university I have worked at aquariums, safari parks and science centres in the UK and in New Zealand. 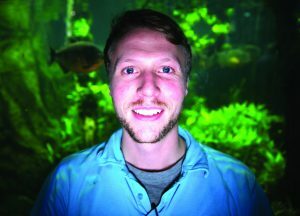 Although I got my first job at the SEA LIFE London Aquarium about four years ago, my current role is the peak of all those experiences. That’s easy: I love working with so many different animals. They make every day totally different from the last! I spend some of my time working with our poison dart frogs and it’s awesome when they’ve produced mini frogspawn and tadpoles that we rear to be new tiny baby dart frogs! Other days I am diving with our sharks or green sea turtles, or moving baby stingrays or feeding our Cuban crocodile. Some aspects of the job can be very tiring and dirty, like lugging salt and sand and sharks around, but it’s always worthwhile when things go well. Probably the only other tough thing to deal with is the smell after a day of chopping up fish food for our more than 2,000 animals! You need to be attentive and careful in the way you work, as poison dart frogs have specific requirements for heat, temperature and food in order to be happy in their home and to encourage them to breed. It is also helpful to be creative so you can recreate beautiful snapshots of natural environments for our animals to live in and to inspire and educate our guests. Where should young people start if they like the idea of this job? That’s a tricky one… a relevant qualification goes a long way, so a degree in marine biology or an animal care or aquatics diploma are always helpful. However, nothing is better than relevant experience and a lot of animal keepers volunteer wherever and whenever they can to gain it. The most valuable thing, though, I think, is to be passionate about working with animals; this drove me to get all the qualifications, experience and skills that I needed.